Alexis Hernandez uses a handmade screen print to design a t-shirt Tuesday at the Artesia Public Library. 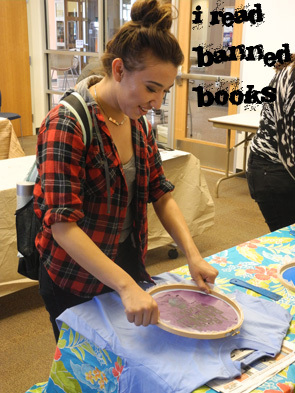 This week, the library is celebrating Banned Books Week by hosting banned book-themed activities. Some popular banned book titles include “Brave New World,” “Of Mice and Men” and “The Catcher in the Rye.” The library has a display of many such books available to check out. Banned Books Week is ongoing through Oct. 3.